how to activate walnuts: warm or cold water? Walnuts are a great source of iron, selenium, calcium, zinc, vitamin E and some B vitamins. They contain mono-unsaturated fats, but they are also a great source of the essential fatty acid omega-3, which can help fight depression, and support brain and eye health. Walnuts contain plant sterols which help in controlling blood cholesterol level and increase the good cholesterol (HDL) levels in your body. Read more on the health benefits of nuts. If walnuts are good, why do we need activated walnuts? 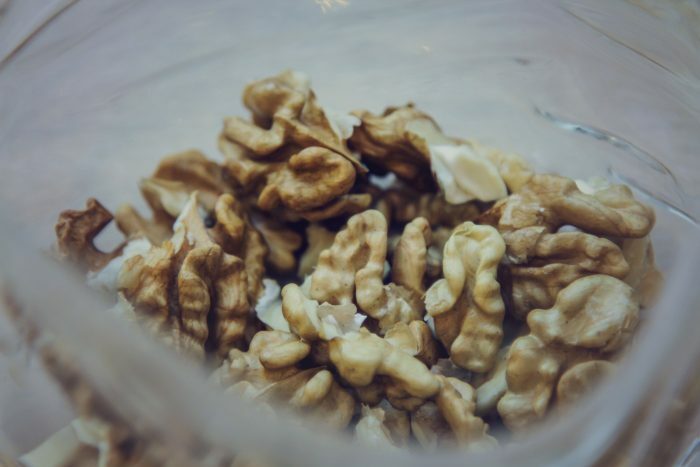 Like all nuts and seeds, walnuts also contain enzyme inhibitors and phytic acid. These can stop our digestive system from absorbing their nutrients. In fact, they reduce the digestibility of these foods. People consuming raw nuts regularly may experience poor digestion, gas, and bloating, or even stomach ache. Soaking walnuts in salty water for about 8-10 hours not only helps digestion and nutrient absorption but also improves their taste. In fact, raw walnuts can taste bitter sometimes, but activated walnuts are particularly mild in taste. Additionally, after they have been dehydrated, they also become crispier! Coming to the question we were asked, there are different opinions in regards to the temperature of the water we soak the nuts in. The most popular way is to use filtered water at room temperature. Hot water shortens the soaking time, but bear in mind that heat destroys the nutrients. And if you’d like to try activated walnuts which taste flavoured deliciously with salted caramel and maple syrup, try ours! You don’t even need to get out to buy them! They will come straight to your door, delivered weekly or fortnightly with our easy subscription plans!